How can you make your meetings more efficient? Meetings are often regarded by employees as being a major source of inefficiency in the organisation. 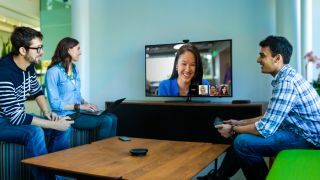 At the centre of this notion is the meeting room itself that features some kind of presentation technology – be it a PC or laptop and a shared screen. The reasons for meeting inefficiency range from lack of preparation and poor leadership, to low engagement or participation and technical issues. While technology may not have a role to play in the former, it certainly can assist in bolstering participation and eliminating any hiccups caused by aged or ineffective equipment. With today's organisation hit hard by the BYOD trend it is now more important than ever before to ensure that the technical infrastructure in the meeting room can effectively meet the requirements of a workforce using a multitude of different devices. This is especially important considering that analyst Gartner predicts by 2016 almost 40% of organisations will not be giving staff laptops or PCs, and that by 2017 BYOD will be requirement for employees from 50% of companies. So how can technology enable efficiency in the meeting room? Firstly, the meeting room equipment must be able to support different devices, such as laptops, tablets and smartphones, as well as different operating systems, without the need for cables, connectors and specialised adaptors, or the reconfiguration of settings. A wireless system that makes use of Wi-Fi and USB technology to connect users of all devices to a shared screen can remove many technical challenges. In addition, several people often need to share the common screen at the same time, for training, presentation or participation purposes, and having a technology that enables them to do this is key. More than that, however, is the ability for many participants to be able to display their screen on the shared monitor quickly and easily, with the simple click of a button. Eliminating the technical challenges from the meeting room can, indeed, contribute to making meetings run smoother and more efficiently. It is the presence of enabling and supportive technology that will be key in making the meeting room of the future a viable solution, today.